I realized that most of these images would not be something you would find in a genealogy file, so I took a photo of a document with my iPhone. You can see the setup in the first image above of the Shotbox in my living room. After taking the photo, I uploaded the image and opened it on my computer and straightened it. Here is a close up of a portion of the photo. The document is not perfect but the image is a good copy and well suited to uploading online. 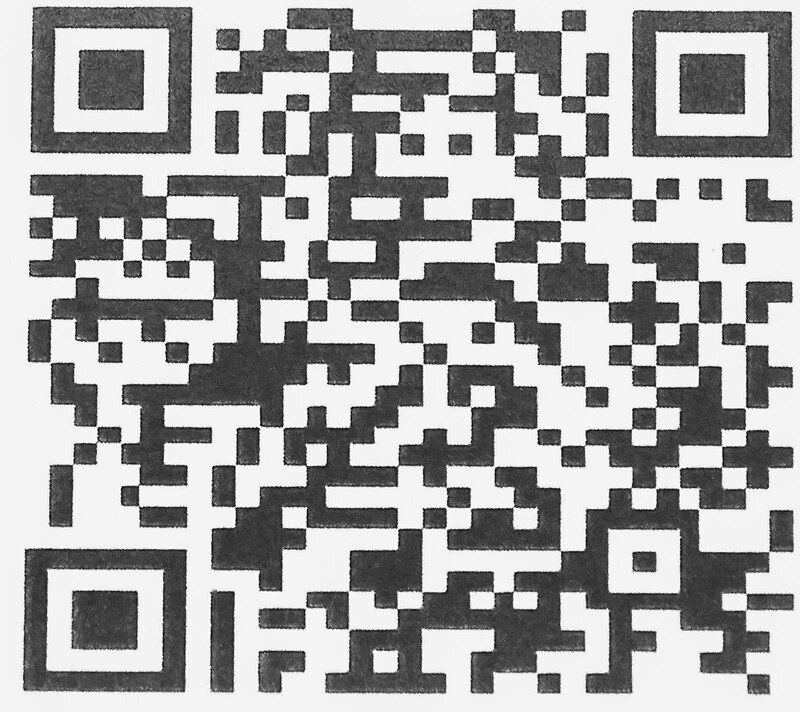 It is very much easier and faster to take a photo of a document than it is to scan it. I could use a higher resolution camera than my iPhone, but this image illustrates the fact that an 8 Megapixel image is sufficient. When I upgrade my iPhone, the camera will be 12 Megapixels. 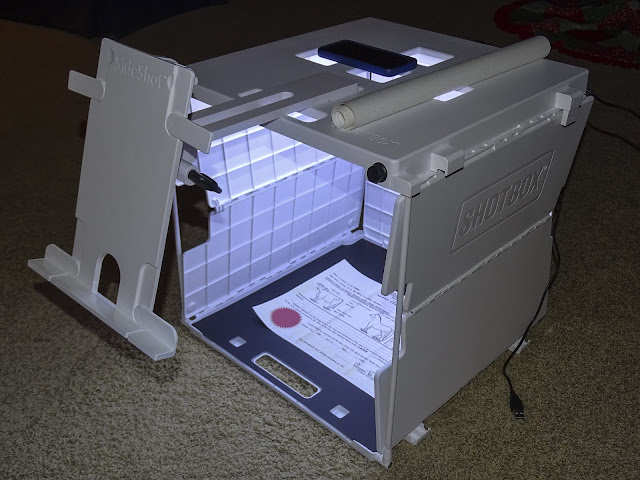 If you think about it for a minute or two, you can begin to see the possibilities of using a portable light box to preserve all sorts of documents and artifacts. I am sure to take a lot more photos with the Shotbox. I will also be visiting with the company at their booth at RootsTech 2016. I looked back to my posts at the end of 2014 and realized that the more things change the more they stay the same. I spent a couple of hours yesterday in front of a ScanPro looking at microfilm. This is a strange mixture of old and new technology. My introduction to microfilm was so long ago now, I cannot remember when I viewed my first genealogical microfilm roll, but it was likely in about 1982 in the old family history library in Mesa, Arizona. This was before they built the present building which is now closed and are now back using the same, old building where I got my introduction to microfiche and microfilm. The good news at the end of this year is that the Mesa FamilySearch Library is open three days a week now at the Training Center at 464 E. 1st Avenue, Mesa, Arizona. But here I am at the end of another years still looking at microfilm. After a banner year in 2014, as I have noted several times, blogging has settled down to a reasonable level. As of 31 January 2015, this will be my 4,147th post. That is a lot of words. The number of page views, according to Google, is climbing above 3.2 million. The view out my window has gone from snow and ice to summer green and back to snow and ice. I have come to suspect that the statistics shown by Google are shortsighted. Many of my posts are viewed in venues not measured accurately by Google. But I find some interesting indications of the extent to which writing can spread. When I arrived at the Brigham Young University Family History Library yesterday to view microfilm, there was a patron asking for help with scanning some old photos. I was standing at the Help desk and made some comments and she immediately responded, "You are James Tanner, aren't you?" Oh well, I finally realized that I can be visiting a library and have someone recognize me! But think about this. A library? I guess I am really typecast. The basic theme of 2015 has been the onward march of technology. One significant change in technology is just now beginning to impact genealogy. The tipping point actually occurred in 2014, but was not well known until 2015. The number of global users of mobile media are now significantly greater than desktop media. However, consistent with past performance genealogical database and software companies are at the very back of the pack in adopting mobile technology. It was only in the past year or so that a few more of the genealogical software companies made their products available to Apple computers. There has been a dramatic increase in the number of mobile apps for genealogy, but the utility of these apps is limited. The reality of life online is that serious data entry (i.e. adding information to a family tree) requires a keyboard. Mobile devices, up to now, have been focused of experiencing data from the Internet, not adding data. That changed significantly with texting and photos from smartphones, but the reality of genealogy is that it involves more than a 140 character tweet. Online social networking has become even more entrenched as the dominant force in technology. Aided by the increased availability of mobile devices, genealogy is now seeing its impact. From my viewpoint, bloggers are getting lost in the online noise from Facebook, Instagram, Twitter and all the other programs. This change in mobile devices has me seriously considering using an iPad Pro instead of a laptop computer. The key to this transition is a complicated combination of keyboard availability and software expansion. Part of this transition is based on the fact that I am moving from a desktop program for word processing to an online base. Yes, I am abandoning Microsoft Word for Google Docs. Over the past month or two, I have been carefully analyzing my laptop computer usage to see if a transition to an iPad Pro would work or not. My conclusion is that almost all of my current usage of a laptop, in my case a MacBook Pro, can be duplicated with an iPad Pro, if I move to online programs such as Goggle Docs. Does this also mean I am abandoning my desktop programs? Not at all. I have firmly concluded that I will not give up my 27 inch screen for an iPad. But right now, I have an iPhone, an iPad, a MacBook Pro and an iMac. I am definitely thinking about eliminating one of those and the one to be eliminated is not the iPhone or the iPad or the iMac. My basic method of doing genealogy has changed over the year. For example, yesterday when I went to the library, all my research notes, lists of microfilm and other information was online, either in Google Docs or the FamilySearch.org Family Tree. All I had to carry to the Library was a couple of flash drives to capture documents from the microfilm. As I mentioned, I was using a ScanPro to view the microfilm, so all I had to do was click to get a copy of any information I found. 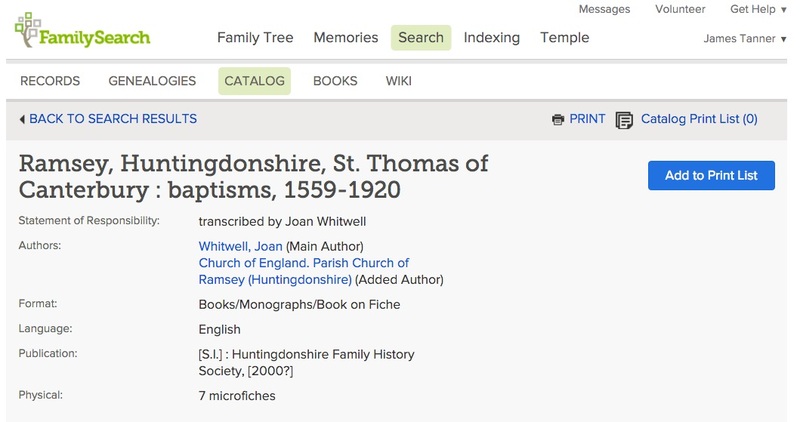 I did find three new English parish entries and the information extracted from those entries went into the FamilySearch.org Family Tree and the copies of the documents were immediately loaded in the FamilySearch.org Memories and attached to the individuals. I also loaded a copy onto my flash drive to take back to my desktop computer where the images will be stored and backed up just in case someone erases them from the Family Tree. I realized that I could have saved the weight of the flash drives by using Dropbox. So, I have just eliminated all the paper from my genealogical research. But, I am still tied to programs that run only on desktop computers and keyboards for data entry. Oh, I used voice recognition (Dragon Dictate) a lot during the past year, but it is not suited for genealogical data entry, but it is good for writing if you watch what is transcribed carefully and edit out the mis-interpreted words. But it is at least as accurate as my typing, with my tendency to drop words and choose the wrong word at times. I find myself moving towards a more technology based work flow, if that could be imagined to be possible. I definitely prefer reading books on an iPad rather than holding the paper book. I am not giving up paper books any time soon, but the iPad is much easier to carry around and I can read in low light situations without trying to find a lamp to read under. I don't see the overall genealogical community changing very rapidly and as I have already noted, there is a serious lag in technological adoption. But the new year promises to have an increased number of webinars, videos and blog posts, so things will keep busy for me. I plan to help write another series of books, maybe twelve more, present hundreds of classes and talk to hundreds of people about their genealogy. I am still on track with one new video a week and so things will just keep rolling along. FamilyHistoryExpos.com is proud to announce that we made our goal of writing twelve books in twelve months. The 12th book, Locating Ancestors in the Old Country, A Research Guide, has just been made available on the website. Each of the books is supported by a series of webinar videos and class handouts. All of these can be purchased on the FamilyHistoryExpos.com website. Also, so far, five of these books are available on Amazon.com. We plan to add all of them to those offered on Amazon.com. Simply search for the name of the book or the name of an author on Amazon. Military records hold an abundance of information that you may not be expecting. You never know what you may find until you look. This guide will give you in-depth resources, methods, and strategies to move forward with your military ancestor research. Learn to read old style handwriting, how to use catalogs, and many more skills to speed up your access to locating and understanding the records. Presenters include: Arlene H. Eakle, James L. Tanner, and Holly T. Hansen. The power of marriage documents in family history research is astounding! Did you realize more than 16 official records are created at the time of the event? With in-depth detail, sources and strategies this printed research guide will help you break your losing streak. Presenters include . Arlene H. Eakle, James L. Tanner, Holly T. Hansen, and Ruby Coleman. Researching the British Isles? This Research Guide shares the latest up to date information for researching your British Isles family tree. It contains in-depth detail, sources and strategies, bibliographies of additional research sources are included for furthering your research success. Presenters include . Judith E. Wight, Arlene H. Eakle, James L. Tanner, and Holly T. Hansen. 296 pages filled details on locating and using in-depth sources, strategies, and methodologies for researching your German ancestors. Ruth E. Maness, AG has the latest details for you in this guide. It contains info for online research as well as on the ground. With more than 230 pages of instruction and detail on in-depth sources, strategies, and methodologies for researching census records for your ancestors. Arlene H. Eakle, James L. Tanner, and Holly T. Hansen have the latest details for you in this guide. It contains info for online research as well as on the ground. This series of classes goes over the basics and into the details of immigration, emigration, and migration. These classes are recorded live in Salt Lake City. Presenters include: Arlene H. Eakle, James L. Tanner, and Holly T. Hansen. This Research Guide will help you understand the elements of research, sources, strategies, and methodologies used to successfully research your New England Ancestors. Classes will be recorded in Salt Lake City. Presenters include: Arlene H. Eakle, James L. Tanner, Ruth Ellen Maness, and Holly T. Hansen. The basics of Scandinavian Family History Research! With in-depth sources and strategies. 100 pages of research guidance in a nice printed book.Ruth Ellen Maness, Arlene H. Eakle, and James L. Tanner are the research professionals participating in the live presentations. Understanding the elements of research is critical to your success in Southern States research. This Research Guide will give you insight you need to break through your brick walls. Classes will be recorded in Salt Lake City. Presenters include: Arlene H. Eakle, James L. Tanner, Billy Dubois Edgington, and Holly T. Hansen. Probate is a process that proves the will of a deceased person is valid. Probates include wills, estate inventories, letters of administration, and other documents relating the the settlement of a deceased person's estate. There is an abundance of information in these records. If a person dies without a will there may still be proceedings recorded and genealogists benefit from these records tremendously. This Research Guide offers you step by step assistance into probate research. Presenters include: James L. Tanner, Arlene H. Eakle, and Holly T. Hansen. US land and tax records hold tremendous amounts of informtation on families. This series of classes goes over the basics and into the details of locating and using land and tax records. These classes were recorded live in Salt Lake City. Presenters include: Arlene H. Eakle, James L. Tanner, Ruby Colman, and Holly T. Hansen. Bypass the burned counties with your Virginia research. This research guide will help you bypass the record loss as you learn about different jurisdictions that created records that have not been destroyed. These classes were recorded live in Salt Lake City with Arlene H. Eakle, James L. Tanner and Holly T. Hansen presenting. If you focus on the vast stream of documents being digitized every day, you might begin to think that the major issues of genealogy today are the need to digitize documents and index them. Granted, this process is proceeding at a furious rate and more and more documents become available every day, but there is a mountain yet to be climbed. Digitization is still in the foothills of genealogical issues. The real issues are restrictions on access. What good is a digitized document if you cannot use it or view it? Let's suppose that sitting in a library somewhere in the United States (or anywhere else for that matter) there is a book containing your family's history. I mean a detailed history full of wonderful source citations, photos, document copies and everything your need to move out to the limits of reality. But there is one problem. Access to the book is limited by its repository. This book is classified as a "rare" book and there is only one copy in existence. The creator (author or whatever) of the book gave it to the repository (library etc.) with the caveat that it can only be viewed under certain very restricted circumstances. In this hypothetical case, you have to be a recognized academic researcher to gain access to the document with credentials from a recognized academic institution. So no matter how valuable that book may be to your research, you may never be able to see it or use it unless you happen to be a professor at a recognized university or want to hire one to do your research. This particular document covers the exact time and place that I need for my research. I note that it has not yet been digitized. Realizing that FamilySearch rents microfilm, I decide to order the record so I can view it locally. Here is the information about the film. Apparently, this particular record exists in the form of 7 microfiches. These are little rectangular pieces of film with maybe a couple of hundred micro-images of the document that have to be viewed in a microfiche viewer. The way FamilySearch.org works, I can click on the little film icon under the "Format" column and go to a place to order the film. The note on the Online Film Ordering page says "Film No. 6108687 is not current available for loan." Hmm. This seems to be leading me to the hypothetical book example I just wrote about. Not wanting to take no for an answer, I evaluate my options. Since I happen to be living next to a very large library, I decide to search the Brigham Young University Family History Library and see if they have the same documents. I go to the Library's website and put in the film number. So, I can only view this microfilmed record in Salt Lake City, Utah at the Family History Library. In fact, when I go to the Family History Library, I will find that I can only view this record by giving them my driver's license for security and looking at four pages of microfiche at a time. At this point I should explain that this is a real example of a record I tried to look at recently. Why all this security for a record from 1559 to 1920? It would cost a few pennies to reproduce copies of the microfiche and make them available. 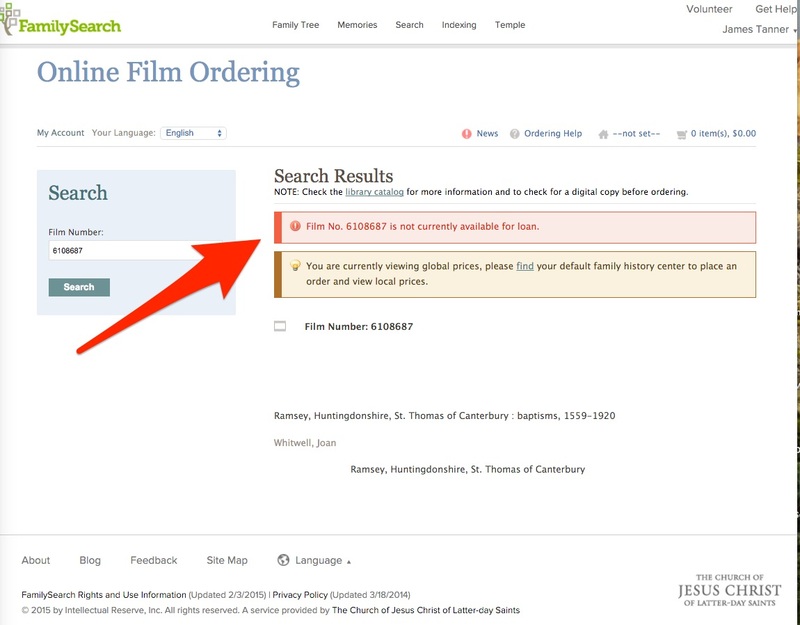 If I was able to order the document from FamilySearch, it would cost me $7.50 for a short-term loan unless I order the film into the BYU Family History Library where there is no charge. But the charge is not the issue. Free or not, I can only view the record if I go to Salt Lake City. Because I happen to live in Provo, this takes me a minimum of four or five hours including driving, parking and etc. If I lived outside of Utah, it would take considerably more time and expense. I will never know how valuable or worthless this document is to my research, unless I comply with the access requirements. Do I really care at this point about the reason why this particular old document is restricted? Wait, what about looking for this record on some other website or whatever? I do a Google search for the document. 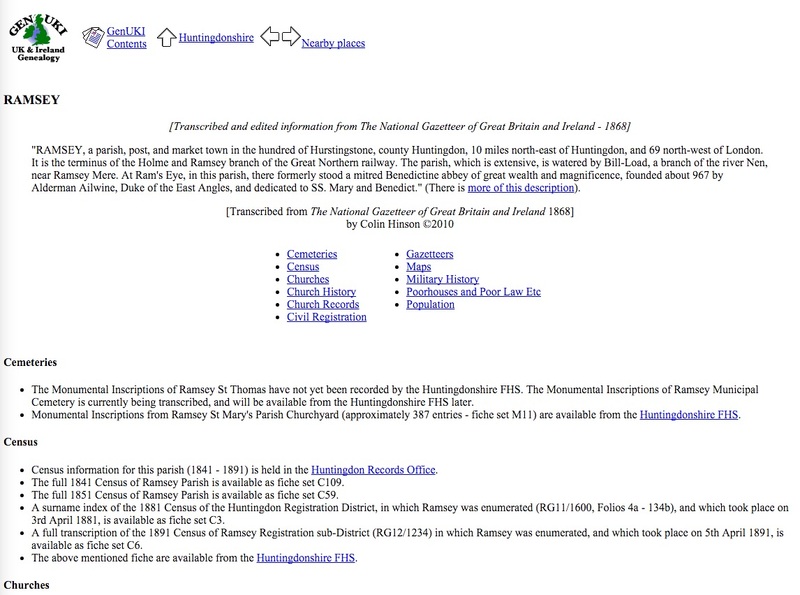 I find the GENUKI.org.uk website with a lot of information about Ramsey, England. The particular records I am seeking are listed. I find out a lot more about the records. 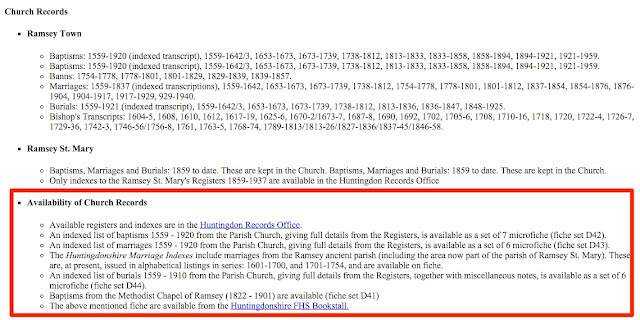 There are really three different sets of microfiche, one for baptisms, one for marriages and one for burials and they are not the original records: they are indexes. 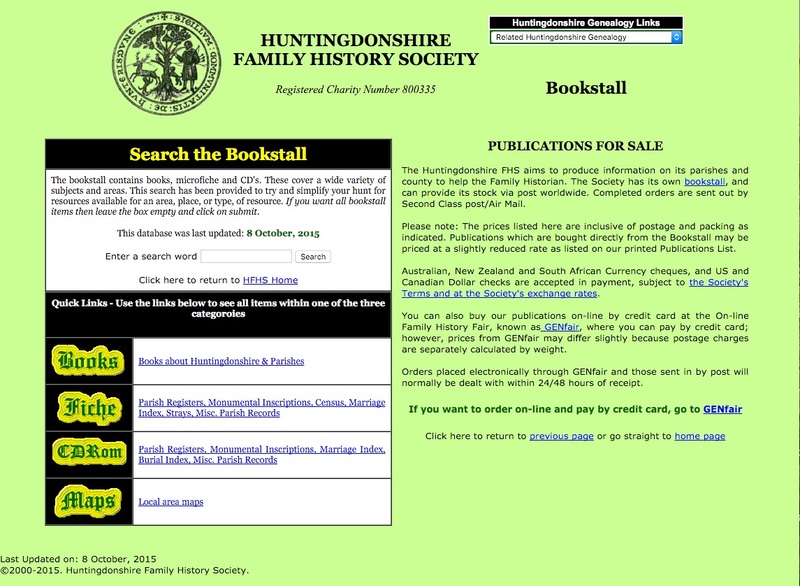 The fiche are available from the Huntingdonshire FHS Bookstall. 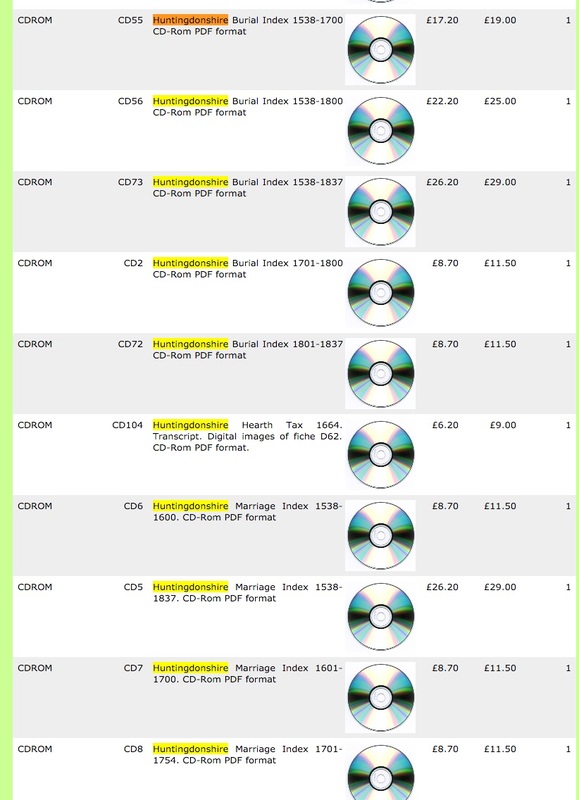 I find a whole list of records on CDs. At the current exchange rate, the 29 British pound disk would cost me $43 U.S. dollars. Well, driving to Salt Lake is looking more realistic all the time. It turns out that the index is owned. That is why it is restricted. 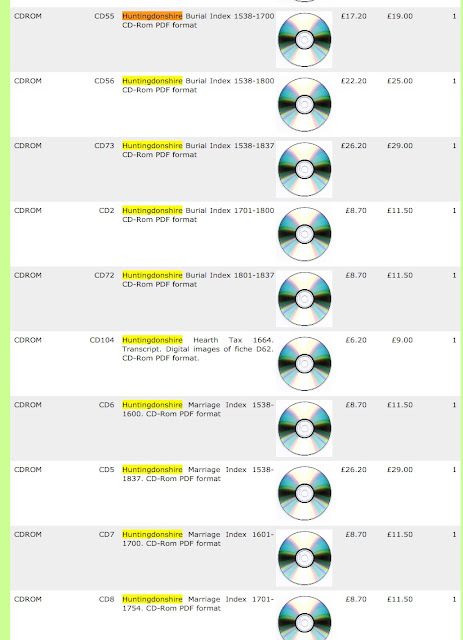 Whether or not you agree or disagree, the Huntingdonshire Family History Society has done the work of indexing these records and wants to get paid for their work. But how do I know which of these records contain any information about my family? I don't. I have to pay the price and may not find anything at all. What about the original records? Don't they exist somewhere? What if I don't particularly trust the indexers? I am out of luck. 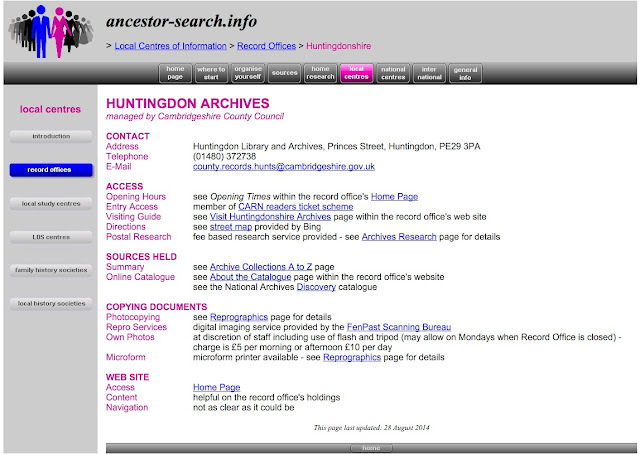 The original records are sitting in the Huntingdonshire Archives and Local Studies office in Huntingdon, England. A trip to England or a trip to Salt Lake City? Even if I choose to go to Salt Lake City, all I can see is the index. This example is far from unique. Ultimately, this whole business of digitizing the records is going to come down to the issue of availability and access. 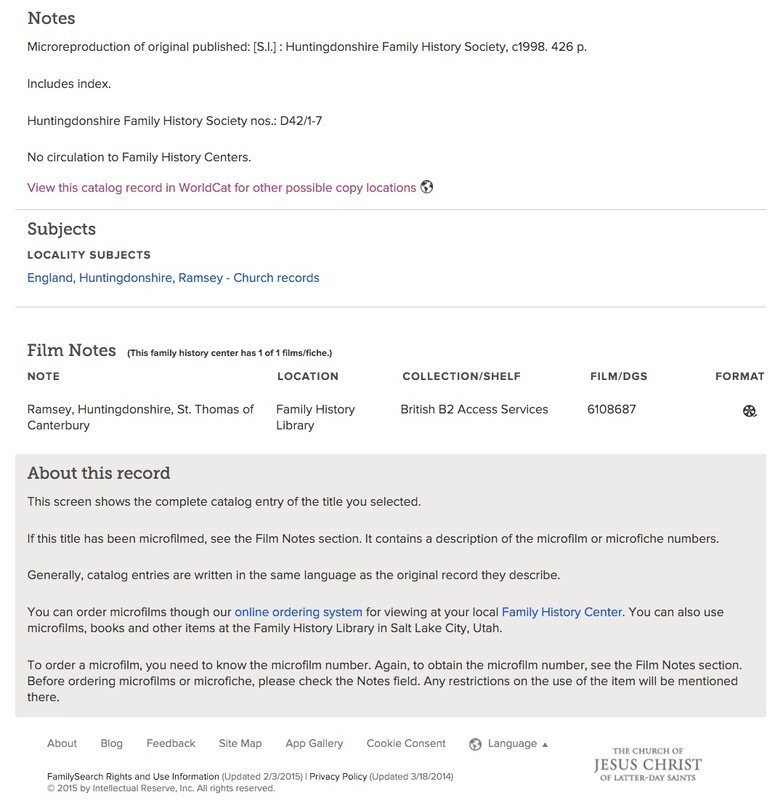 Do you think the folks over there in England are going to be anxious to allow FamilySearch or anyone else to digitize their records and allow them to be viewed for free? Not likely. Access is the real issue in genealogical research and the issue of access is not going to be solved any time soon. I could give a lot more examples from libraries and private repositories here in Utah and throughout the world. All this boils down to the idea that they have the record and they are not going to let you view or use that record unless you comply with their terms and those terms usually involve a major time and/or expense investment on the part of the researcher before the researcher even knows if the document contains the information being sought. Just in case you thought digitization was the answer. How does geographic clustering work? 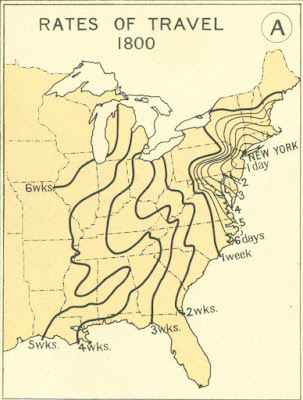 In my second post in the series on "Solving a Complex Genealogical Challenge - Charles Parkinson -- Part Two" I illustrate the principle of clustering geographic areas to determine the likelihood that a group of people are related. I believe this particular methodology needs further explanation. As we go back in time, transportation issues become more and more important. Today, we can fly across whole continents in a matter of hours. In the 1800s and in earlier times, distances were measured in days, weeks and sometimes months of travel. My examples have been focused on the FamilySearch.org Family Tree because it is freely available to all registered users, but any pedigree in any program will suffice for examination and correction. To gain an educated perspective on the time it took for travel at different dates in the past, it is important to read some basic history and realize when certain transportation improvements became generally available in the area where your ancestors lived. 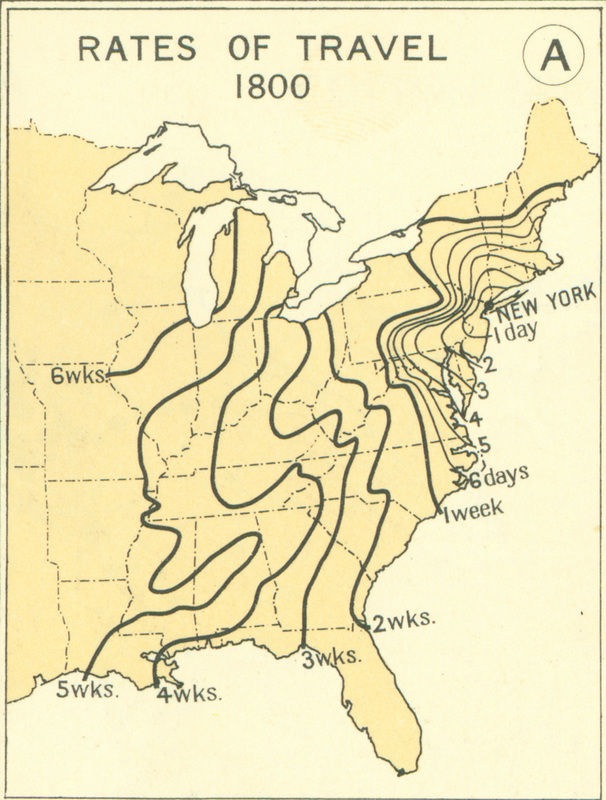 For example, here is a map showing the rates of travel in the United States in 1800. This map is somewhat misleading. It assumes that the traveler would take the most rapid form of transportation available. In many cases, people had to walk or ride a horse and the travel times were limited by weather, terrain, major obstacles such as rivers and mountains and many other factors we tend to ignore today. Two people may have lived only a few miles apart and yet they may have never met or had any contact with each other because of a lake, river, canyon or mountain range. When doing genealogical research, people have a tendency to ignore geography in deciding when two people are related. This becomes a huge problem when families have been compiled by focusing on names and ignoring geographic reality. This fact can be demonstrated over and over again by referring to any online family tree program. In any list of children, especially when there are a large number of children, it is very common to find some who lived well outside the reasonable area of consideration. To illustrate the problem, I routinely put any places identified in a family tree on a map to see if they are reasonable. Here is an example that took me only a few seconds to find in the FamilySearch.org Family Tree. Here we have a man named Thomas Richardson who is supposedly married to a woman named Anne Bennet. There are two marriage locations and dates for this couple: 1 October 1745 in Glatton, Huntingdonshire, England and 30 September 1767 in Saint Andrew, Enfield, London, England. This is an extreme example because obviously the marriage could not have occurred in both places. But the question is where did these people live? If you examine each of the listed children, you will see that they were all listed as born in Glatton, Huntingdonshire, England, therefore, if these places are correct, then the marriage in London is highly unlikely. Why is this the case? 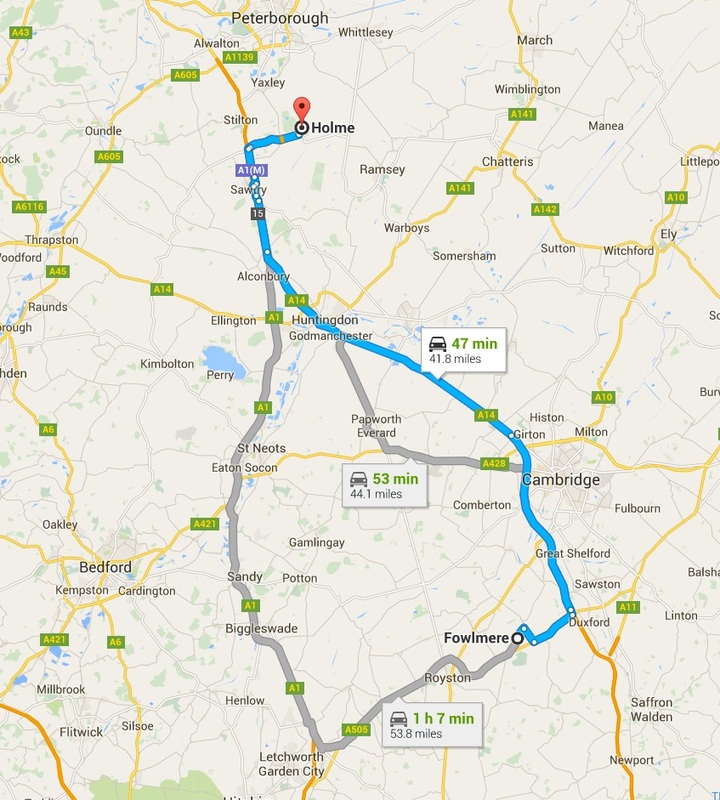 The distance from Glatton to Enfield is about 67 miles. It might take as long as 20 hours of more of walking or two days on a horse to go that far. It is not reasonable, absent some other consideration such as relatives in the area or the location where the wife was born, to account for the discrepancy caused by the distance in the mid-1700s. An extension of this principle is the idea of "clustering" all of the places listed in a pedigree to ascertain whether or not there are any anomalies. As you trace your families back in time they will appear to cluster in an area. 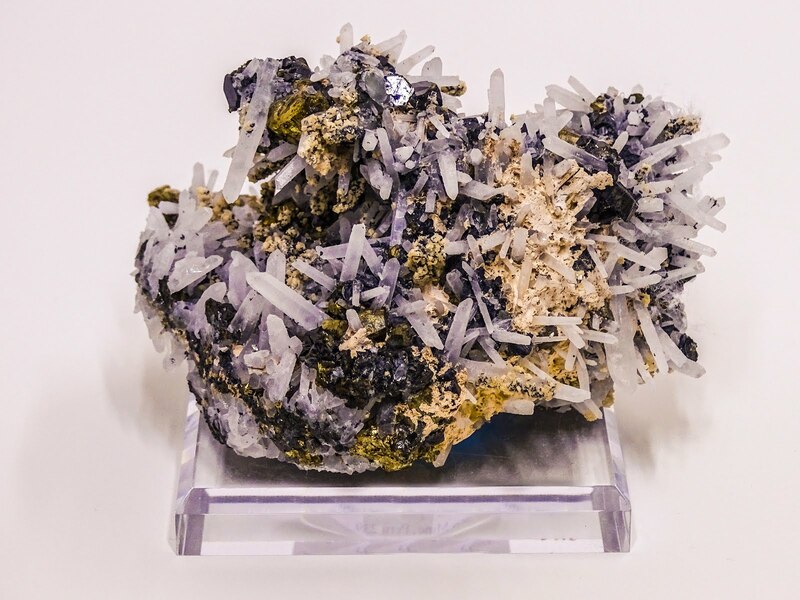 In many cases, one or more individuals will then break out of the cluster and may form a new cluster in another geographic area. In my own family clusters have occurred in Denmark, England, New England, Utah, Australia, Arizona and many other places. For example, all four of my grandparents and all but one of my great-grandparents lived in close proximity to each other at some time in their lives. If you find someone who seems to have the same name as your ancestor and you cannot locate an event in their life, then you cannot conclude, on the basis of name alone, that the person is related. It is also important to look at the naming patterns of the areas where your ancestors lived. In some countries at different times some names were extraordinarily common. To the extent that names are commonly used, the issue of geographic location becomes more vital and can extend down to identifying the exact house or farm where the people lived in order to be accurate. I suggest mapping out all of the locations you encounter. It is always a matter of note when I am working with patrons at the Brigham Young University Family History Library that so few people are even vaguely aware of the locations of the places they are listing for events in their ancestors' lives. A last note. Indicating that an ancestor was from England or New York or whatever is really an excuse for avoiding research. A general geographic location does not identify an individual. My relationship to the family is set out in the first post in this series. 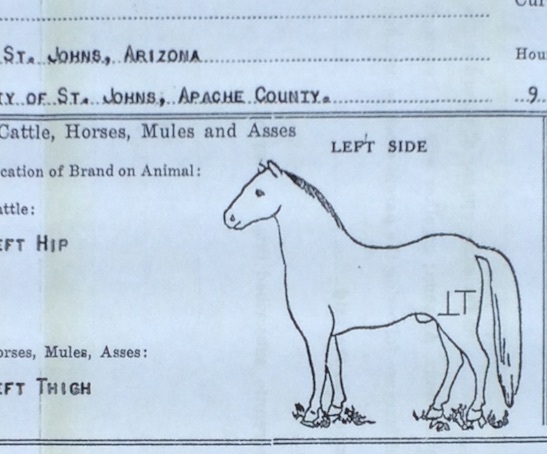 The first step is checking for consistency in the places identified in the family line. To do this, I include all of the verified and unverified locations listed in the Family Tree. The time period involved is also important. In this case, the earliest dates for a verified Parkinson ancestor are in the mid-1700s. Charles Parkinson was supposedly born in Great Raveley, Huntingdonshire, England in 1766. There is a christening date in the FamilySearch.org Family Tree for 12 May 1772 in Great Raveley, Huntingdonshire, England, but there are only records showing his marriage and death dates. He also shows up in the 1841 England Census. If you would like to see the sources attached, you can go to Charles Parkinson, ID# 2CY9-YDS in the Family Tree. 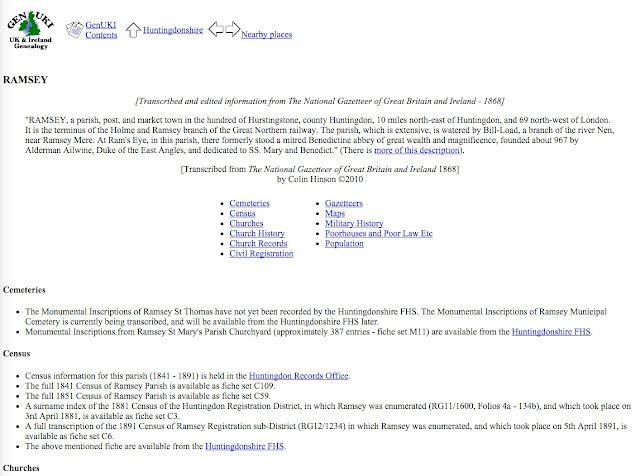 The first research challenge is to see where the christening date was obtained since none of the records I have located so far contain either birth or christening information about Ramsey or Great Raveley. Here is a list of all of the place names mentioned by the entries in the Family Tree starting with Thomas Parkinson and omitting places in the United States. The next step is to look for anomalies. Any incomplete places, such as an event that occurred in "Huntingdonshire, England" or just "England" is a dead giveaway that the research is incomplete and that the entry is more than likely inaccurate or guesswork. For example, a few generations out on the Parkinson line shows the following as a spouse of a supposed ancestor named Daniel Scott, b. 1727 in Huntingdonshire, England, who was christened 12 Jun 1727 in Fowlmere, Cambridge, England. This same Daniel Scott was supposedly buried in Holme, Huntingdonshire, England on 8 Jun 1800. How far is Fowlmere (if it exists) from Holme? The issue of the two counties, Huntingdonshire and Cambridgeshire, is complicated by the fact that portions of Huntingdonshire were merged into Cambridgeshire in 1976. But the relationship between these two counties is further complicated by the fact that they are contiguous. Fortunately, we have an almost endless supply of online, digital maps to consult. Here is a Google Maps plot showing how far Fowlmere is from Holme. Not that far unless you realize that these people lived in the early 1700s and had to walk or depend on a horse to get anywhere. The walking time by Google Map is over 12 hours, that is two or three days depending on the person and/or the weather. My initial reaction is that if there was a Daniel Scott who was born in Huntingdonshire and who is buried in Holme, he is not the same person who was christened in Fowlmere. To make this assumption more accurately, you need to be aware of the economic status of your ancestors. In the 1841 England Census, my ancestors have been classified with the occupation of "A L" which represents agricultural laborers. These people were not likely to have traveled extended distances for births, christenings or marriages. An event recorded in the Family Tree (or anyplace else for that matter) is more likely to be an error if the places recorded are too distant from each other. But, as I have mentioned before, as we get closer to the present time, this becomes much less of an issue. With that as an example, it is important to plot all of these locations on a map, such as Google Maps, and see how rational they are considering distances and the time it would take to ride or walk between them. Here is an example of some of them plotted on a map. As you plot all of these places on a map, you may immediately find that some of them are not towns or other populated places. In the list above, Middlemoor is road and Glassmoor is a manor house. But the important fact here is that all of these places are relatively near each other. None of them are so far as to make it seem impossible that a person living at that time and place could have an event in their life in that place. That is why the example of Daniel Scott above is questionable. As you go back in time, the proximity of the places increases in importance. Of course, today where two people met and married can be random. If you determine that all of these places existed, next you have to survey and find out where the records for each of the locations were likely located. In England and many other countries, this involves identifying the parishes where these people may have been born, christened, married, and buried. At this point, it is absolutely necessary to start with a definite, known location and an identified person. So now I am back to Charles Parkinson. The key here was finding this family in the both the 1841 and 1851 England Census records. Stay tuned for the next installment. This could take me a while since I am ordering microfilm and searching microfilm for records of this family. I began collecting postage stamps when I was about eight years old. Within a couple of years, I was attending stamp club meetings and began exhibiting my collection at local conventions. I maintained a strong and active interest in stamp collecting (philately) until well into my late thirties and early forties. As a result, I acquired a very extensive and valuable stamp collection. Stamp collecting and other such pursuits are no longer of interest to the Lego obsessed and video game addicted youth today. But being involved in stamp collecting for such a long period of time and at a semi-professional level taught me some lessons that have proved valuable to my genealogical research. The first and most important lesson I learned from stamp collecting was about geography and history. As I acquired stamps from exotic places, I had to learn about those places. I learned about how European countries had changed over the years as I acquired stamps from Wurttemberg and the Saarland and other such countries that are now parts of Germany. I even learned some foreign language when translating the stamps from Hungary and Finland. I learned about monetary systems and exchange rates. The people and events portrayed on the stamps gave me a sense of history and I read about some of the events and people I saw on the stamps. Condition - the value of any stamp item is directly correlated to its condition, mint stamps were almost always more valuable than a used example of the same stamp. Scarcity - very rare stamps were worth extraordinary amounts of money. The difference between a very rare and valuable stamp and an ordinary one could be a small detail. Popularity - I learned that there were trends and fads in stamps as well as every other collectible. Cars, sports and other memorabilia can sell for millions of dollars. One important lesson I learned rather quickly was that stamp collecting, like any other business that can also be classified as a hobby belongs to those who are educated in its complexities. The casual stamp collector was usually motivated by pretty stamps. Some countries made a sizable percentage of their national income from issuing beautiful stamps for collectors. Usually, these stamps had little or no real value to a serious collector. On the other hand, the really valuable stamps were seldom flashy or attractive per se. Some collectors focused on a certain country or topic. For example, this baseball stamp could become the basis for a collection of stamps showing baseball topics. There were pretty stamp collectors and serious philatelists, just as there are genealogical name collectors and well as serious genealogists. 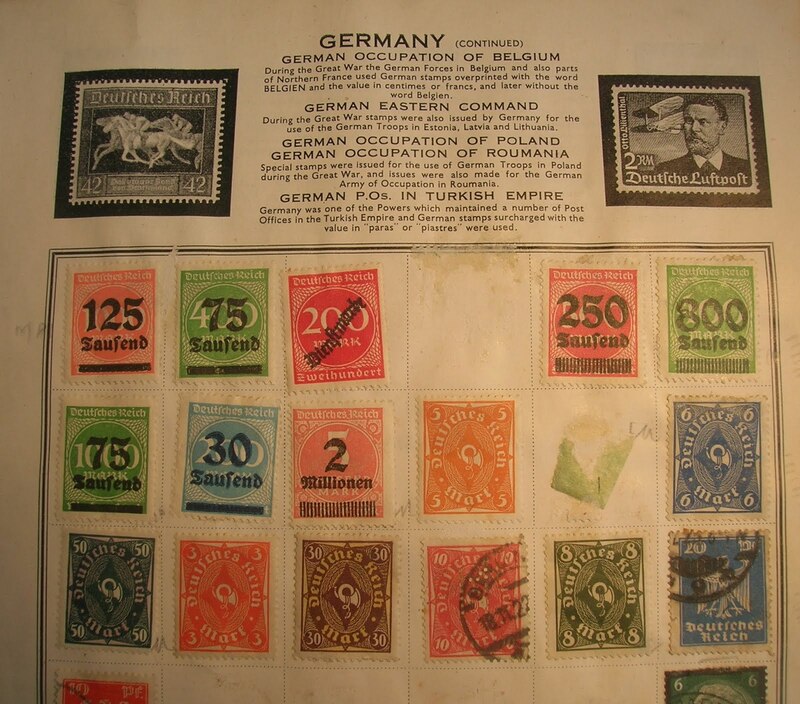 Many of the collections made by children or inexperienced stamp collectors ended up ruining the stamps and destroying any future value. Many times the similarities between the two pursuits is extraordinary. All of this experience with stamp collecting gave me great insight into the pursuit of genealogy. The parallels between doing genealogy and collecting stamps were significant and extensive. Genealogy is a "hobby" that is also a very serious business. Knowledge of geography, languages and history are just a important or even more important than when collecting stamps. Because I learned about the valuation of collectibles and the preservation of valuable stamps, I appreciated the need to acquire and preserve valuable genealogical documents. I also learned about counterfeit stamps and acquired an understanding of how to distinguish between real and bogus sources of information. One of the reasons why I see so few youth involved in genealogy today is because they are not exposed to the discipline or constraints of something like stamp collecting. Can you really imagine any of your youthful acquaintances getting excited about a finding a new stamp? Can you imagine them spending their entire allowance on stamps, like I routinely did? By the way, the self-adhesive stamps issued by the U.S. Post Office today have absolutely no interest to me as a collector. With only a very few exceptions, they will take many, many years before any of them are worth as much to a collector as you pay for them at the local post office. This is sort of like what I now find today in online family trees. The lessons I learned from stamp collecting have served me well in many aspects of my life and most recently in genealogical research. 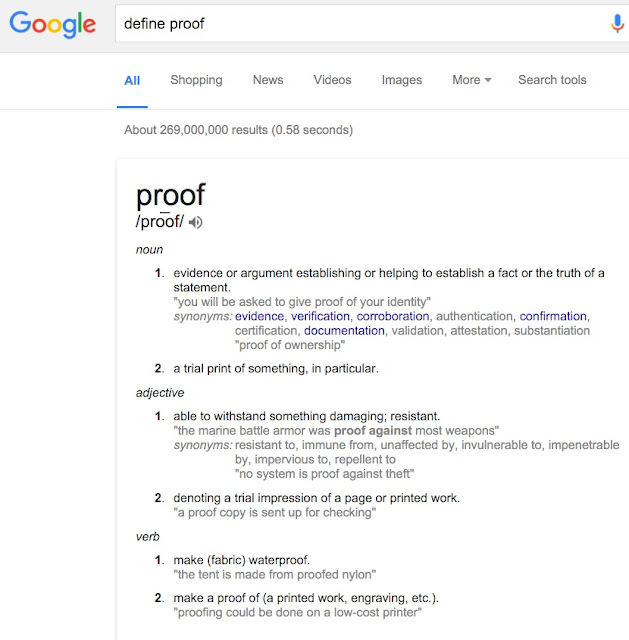 Somehow, you seem to be ignoring the common English language definition of proof and want to redefine it. Simply put, proof is ""evidence or argument establishing or helping to establish a fact or the truth of a statement." That is how the word is used in genealogical research and what is generally recognized by genealogists all over the world. First, I would like to say that I must be successful in writing about proof if this comment is any indication. On the other hand, the comment does raise some interesting points. Is there a consistent way that the word "proof" is used in "genealogical research?" Further, is the meaning of the word "proof" as recognized by "genealogists all over the world" consistent with the definition supplied by the commentator? Most of my own writing on the subject of proof has been directed at the tendency among genealogists of a certain ilk to use legal jargon to support their opinions and personal conclusions. My point in this regard is that legal terminology is inappropriately applied to genealogical research. It is also true that the terms "evidence" and "proof" are used by scientists. I have also questioned the use of those terms by genealogists who allude to scientific accuracy in their genealogical research. My conclusion is that genealogical research is not subject to "proof" in either the legal or scientific sense. Unfortunately, the two words, "proof and evidence," are not clearly defined by most genealogists and in fact, they are often used interchangeably. I find statements that such and such a document proves that the ancestor was born on a certain date, when the meaning of the statement is really that the document provides information from which the researcher has concluded that the event occurred on a certain date. Yes, how you characterize your personal conclusions does matter. By the way, the definition of proof quoted by the commentator has engendered an extensive amount of online commentary. The particular wording of the definition supplied by the commentator comes straight from the ultimate authority on the subject: Google. Hmm. It does not seem that there is a "generally recognized" definition at all. When I search for the phrase "What is proof" in quotes, I got 818,000 results showing the term "proof" used in a huge variety of contexts. The search even comes up with a reference to one of my own previous posts. I would suggest that were proof something that we could all agree on, we would no longer have different religions, political parties, or any other differences. What makes anyone think genealogy is any different? We all have our own opinions and beliefs. What would I need to do to "prove" to you that I was correct? Would that ever happen? As much as we would like to believe otherwise, there are no historical absolutes. What is and has been recorded about the past will always be tentative and will always depend on finding additional documentation. Our conclusions about the past are just that; opinions and beliefs. What I find irksome in the genealogical community are those who support their personal conclusions with jargon and obfuscation and depend on formality to render their opinions as facts. Given what I see happening every day on the FamilySearch.org Family Tree a little more skepticism about the entries would be highly beneficial to the overall accuracy of the conclusions made. The idea of solving any complex genealogical challenge is compelling and from my perspective, the FamilySearch.org Family Tree has recently become an open invitation to research. In the methodology I am outlining with this series of posts, my own ancestral lines as shown in the Family Tree extend a few unsourced generations past my own research. The challenge presented by these unverified, unsourced and sometimes illogical entries is to either verify or correct the information now shown in the Family Tree. What makes the challenge even more interesting is that from time to time other possible family members add or "correct" the information thereby adding insight or frustration to the process. My fourth Great-grandfather, Charles Parkinson, b. 1766, d. 1846 was married to Hephzibah Newton, b. 1773, d. 1856. I inherited the basic information about the Parkinson line of my family from my early early, year's long survey of the Family Group Records in the Family History Library in Salt Lake City, Utah. My paternal Grandfather's name is LeRoy Parkinson Tanner and his mother, Eliza Ellen Parkinson my Great-grandmother, were my Parkinson connection. After I had been researching for a number of years, most of the rest of the information I had about the Parkinson Family came from a book I have mentioned in previous posts. Parkinson, Diane, and John Parkinson. James Parkinson of Ramsey: His Roots and His Branches : England, Australia, America : A Biographical History and Genealogical Record of the Family of James and Elizabeth Chattle Parkinson. Austin, Tex. : Published for the James Parkinson Family Association by Historical Publications, 1987. Charles Parkinson, b. ?, Christened, 12 May 1772, Great Raveley, Huntingdonshire, England, United Kingdom, d. 26 April 1846 Ramsey, Huntingdonshire, England, United Kingdom (??). As you can see, my Parkinson line left England and moved to Australia and then immigrated to the United States. Thomas Parkinson was married in the United States and all his children were born in the United States. James Parkinson was born in England and died in Australia. One of his four children died in Australia, two in the United States and one in England (??). The challenges started when I began the process of researching documentation to substantiate the birth, death and marriage dates. If this seems strange, I should explain that I have been extensively documenting and correcting my ancestral lines generation by generation for a very long time. I have documented almost all of the individuals back to the 5th generation and have been focusing on the 6th generation. I count generations beginning with myself as the 1st generation, so Thomas Parkinson is in the 5th generation and his father, James Parkinson, is in the 6th. Thomas Parkinson had extensive source information concerning his life in the United States, but as I examined the Family Tree and my own records closely, none of these ancestors' birth dates or places had been verified. 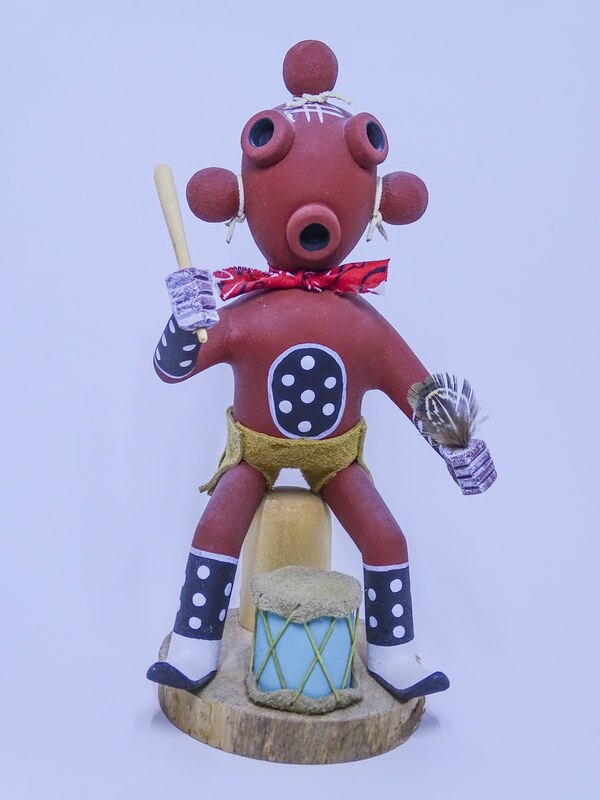 My observation was that when we assume that the information we have been "handed" by our relatives and even our ancestors is correct, we may become blinded to the lack of any real supporting documentation. Historically, among those who accumulated family history or genealogical information, recording detailed source information was not a priority. In fact, it was not my own priority for many years when I first began accumulating information. Pre-computers, I spent well over 15 years merely surveying what had already been recorded by my predecessors. I have made this observation a number of times in past posts, because it is crucial to recognize that much of what has been accumulated, especially as recorded in the Family Tree, lacks substantiation. This lack of substantial verification extends to many paper and online family trees. In this, I believe that we must proceed from a position of doubt absent verifiable and reliable sources. As an aside, as I have written extensively, any allusions to "proof" in a genealogical context are ill advised. The next document you find may call into question all of your prior conclusions. It was also interesting to me that all of these Parkinson lines, both male and female, seemed to end in the 1700s when many of the records in Huntingdonshire go back to the 1500s. The complex genealogical challenge was the fact that all of these families had antecedents in Huntingdonshire, England. As I examined what was in the FamilySearch.org Family Tree I found the following list of surnames associated with this family line, beginning with Thomas Parkinson. I am excluding Thomas Parkinson's wife, Mary Ann Bryant, because he married her in the United States and she did not come from Huntingdonshire. But every other member of this ancestral line, including all the wive's families, appear to come from that same historical county. Right or wrong, the information I had in my own file and that on the Family Tree needed to be verified. As a matter of fact, my own files did not contain any substantiated individuals further back than the 6th generation and so many of the names in the FamilySearch.org Family Tree were not in my file and not surprisingly, they were unsupported by any documentation or sources. Some of the lines in the Family Tree went back a few generations further than my own files but all of them ended, more or less, in the 1700s. So, the challenge is that someone has connected all of these individuals to my family line without any supporting sources. It could be that they are all substantially correct. I can just as easily be that some or all of the extensions cannot be verified and the relationships deleted. 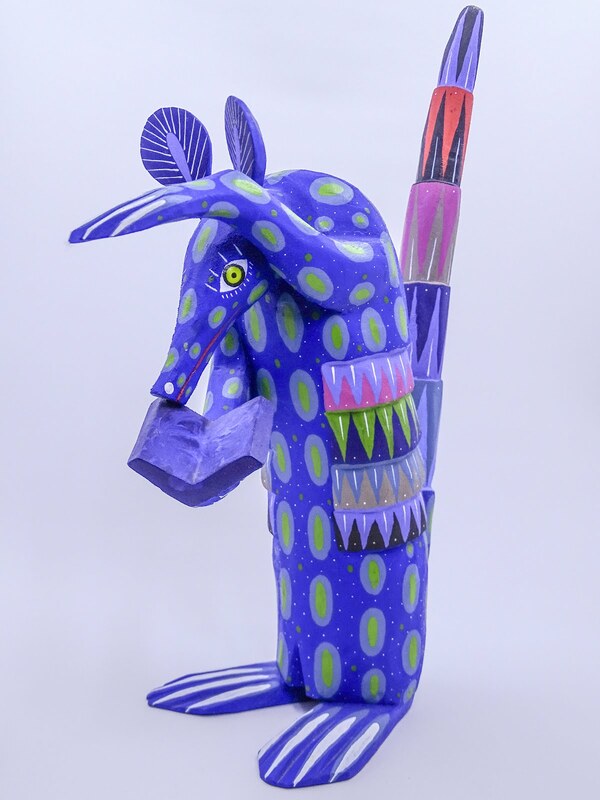 I find myself in the position of being told, by the content of the Family Tree, that these ancestral lines extend. If I am to believe this, I must do my own research. Some months ago, I wrote a series for my Rejoice, and be exceeding glad... blog (which I mis-numbered and never finished) using the Parkinson family as an example. But here, I am using the same family to show the methodology of solving a complex family situation. If I can keep the numbering straight, I will continue this series from time to time as my actual research progresses. Since I wrote my last post, I received a comment from my friend, Louis Kessler, giving me a link to the complete list of submissions. Here is the link: http://rootstech.devpost.com/submissions. Thanks to Louis for this help. Here are links and comments to the apps that I could not find in my first go-around. Please note that the comments added for each of the apps is a copied from their website or other promotional material. In some cases, I may have added a few comments of my own. Please see, "Semi-Finalist pool reduced to 22 in Innovator Showdown for RootsTech 2016" for the rest of the list. Please also note that the Chatteroo program is really "KID CHATTEROO." Goze is a mobile app where people can capture their life journey through photo, videos and unlimited text. Goze lets you create shared events by adding contributors. You can also control privacy by event by simply selecting which friends of family you want to see each event or, keep some completely to yourself. You can also keep them completely private. For those who want a physical way to share their memories, you can export into photobooks and/or on DVDs. Goze exhibits your life journey and you are the curator. Goze will change the way families and individuals record their life history by providing an easy and accessible way to record life's greatest moments on the go. By incorporating a social media element (optional, of course), Goze provides a safe, private place where one can keep all their personal and private memories. Families can collaborate on recording memories of their ancestors or their young families - all in one place. Because Goze is event-based, an simple API to Family Search or Family Tree would make exporting for other purposes simple. People will be doing their personal and family history and not even now it! The original concept was developed by the Company's founder, Nick Jones, while looking for a better way to journal. From his own experience, and from countless interviews with highly successful people, Nick understood the many benefits of keeping a personal record of one's daily life and experiences. At JRNL, we believe that Life is Worth Recording, and that by keeping and reflecting upon past experiences, we can better address future challenges. JRNL was built to record life’s memorable moments as they happen. With solutions available for both Web and mobile, and an easy to use input interface, JRNL lets users record their thoughts, upload content, and reflect on past entries and experiences no matter the time or the place. In addition to private journaling, users can share content and collaborate with others to create a more complete record of events, history, projects and interests. JRNL goes well beyond basic journal creation and documentation, providing helpful prompts and reminders to motivate users to document key events, milestones and historic moments. In addition, the platform provides for the organization and production of any journal into a personalized, beautifully crafted hardbound book. While sorting and scanning our grandmother’s collection of personal papers, we were overwhelmed in a sea of letters, diaries, photos, and other personal documents. As we pored over the handwritten pages, we realized we needed a solution beyond just digitizing. Already avid indexers and family historians, we envisioned a tool that enables individuals, families, and organizations to index and tag their own histories—letters, journals, and other personal records—resulting in an accessible, searchable, archive. With the power indexing has to bridge generations, cross religious and cultural boundaries, and unite people, we became determined to bring family collections of written documents out of obscurity through indexing. 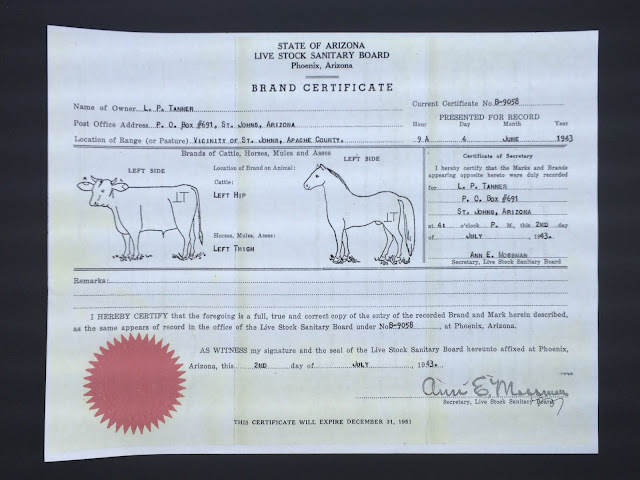 These documents—replete with names, places, and stories—will enrich a family’s history, connect records to researchers, and fuel the find for historians everywhere. Through the Kindex™ web app, users create a “Kindex”—a living archive where anyone can contribute, index, and share family records. Families may establish their two-generation Kindex™ using FamilySearch account, which provides a foundation of family names for your Kindex™. As records are gathered and attached to family names, they can be indexed privately within families or released as public indexing projects. Our indexing tool employs a simple side-by-side user interface where the user enters indexes the record and applies tags. Once approved by a family administrator, completed indexing becomes accessible and searchable through tools such as search engines, Kindex™ and FamilySearch, and other family history partners. Within Kindex™, users may also read indexed records, attach them as FamilySearch Memories, search their content, share on social media, or print to paper or PDF. The youngest children are just beginning to learn family relationships and are often interested in who they are and how they are connected to their family and the world at large. However, family history information and stories are rarely shared in a way that young children understand or find interesting. Today's children intuitively understand how to use touch devices such as smartphones and tablets. They use them to play, watch, and learn. The objective of Little Family Tree is to bring a child's personal family history to them through this learning medium and to share it in a way that is accessible to them. Little Family Tree engages toddlers and pre-school children with their personal family history through games and activities designed for their level. (Most of the games are fun for the kid in all of us.) Personal family history data and photos are obtained by having an adult login to an online family tree such as FamilySearch or PhpGedView. An online family tree account is required to play the game but a FamilySearch account can be obtained for free at FamilySearch.org. Data is loaded in the background allowing the child to explore and play immediately. This app was inspired by our own families and our need connect and to preserve our own family histories. The design was inspired by the simplicity of the "My Family: Stories That Bring Us Together" booklet released by FamilySearch.org in November 2013. The My Family app uses a modern design and many state-of-the-art mobile technologies to connect families and preserve their past. It helps them communicate with each other and stay in-touch. It also helps families collect, organize and share their family pictures, stories and history. In addition, it creates great looking PDF books that can be printed and professionally bound. Any time my family gets together... the story of broken arms, sleepwalking over thanksgiving at grandma's in '96, mom driving the beamer into a pond, etc. get retold… and each time someone is interrupted with waves of “no, that’s not what happened” and other corrections. Through these amazing, emotion-filled family events, I’ve learned that one moment, experienced by many, can produce multiple versions of the story— each valid, real, and valuable in their own way. I realized that listening to each perspective told firsthand made the overall story even more enjoyable. I thought it would be great to capture a single moment from everyone’s perspective. Perspectives is a grandparent-friendly mobile app that enables collaborative storytelling without interruptions. weGather is a free, purpose-driven app that helps families capture the stories behind old analog photos in a fun, social way. Rather than focusing on digitization and storage, weGather focuses on story collection using the power of crowdsourcing. weGather is narrowly-scoped, launching with a focused feature set that's optimized for mobile devices. We're creating an app that's fun to use and most important, gets multiple family members involved quickly! If any of the developers want to add any further information, it would be more than welcome. AncestorCloud, Arkiver, Briobi, EveryStory, Famicity, GenerationStory, GenSoup, Goze, JRNL KID, CHATTEROO, Kindex, Legacy Scribes, Little Family Tree, My Family App, Perspectives, PostcardTree, Scribbitt, Studio by Legacy Republic, TapGenes, The Family History Guide, The History Project, Tribergy, Twile, weGather. I understand that this was about half of the total submissions. I find the following websites or other information about the contestants on this list that follows. It looks like they are in alphabetical order and where I have been able to find a website or other information, I have included a quote from their website or press release or whatever. I am only reasonably familiar with one or two of these programs. I must note that some of these programs have very generic names and I may have linked to the wrong website. If this is the case, be sure and send me an update and I will correct the links. Just an observation: I think that many of these programs need a quick, lead-in description so you can tell what they do. I found that even after poking around on their websites, I couldn't quite figure out what the program was supposed to do for me. I would not be inclined to purchase or sign up for a program for which I had no need. This problem is pretty endemic in the genealogical community. Another observation: by the time I got through this list, I was certain that there were some of these programs that were probably good, but short of downloading the program etc. and working with it, I was totally mystified by the website's sales talk. I would be very glad to have a dialog with the developers so they can explain to me why I might need their programs. Another, another observation: some of these developers need to do a Google search for their product names before they do some advertising etc. Some of these names are so general as to be nearly impossible to find. Even more observations: I would think that this Innovators Summit competition should be divided into startup and an ongoing program categories. Some of these programs have been around for a while and are fully developed websites. That doesn't seem fair to the bare startups. I also notice that very, very few of these programs mention FamilySearch or have anything to do with the Family Tree. This was not the case in past years. AncestorCloud is a community that connects family researchers with willing helpers and professional genealogists. Connect with helpers to pick up records, take local photographs, translate documents, help with research questions or conduct custom research. It's free to join and post a request. Beautiful and easy to use. A place we will enjoy coming to collect, curate and share the stories of life – not just as parents but as people: travelers, artists, journal keepers, family historians, basically anyone with memories worth preserving. Connects to the devices, social media and cloud storage accounts where all our photos and videos are saved. Enables us to capture memories from our heads by writing notes and quotes in real time before they get forgotten. Provides a powerful range of organizational tools like collections and tags that suit the preferences of different users. Easy to share privately with close friends and family without making them sign-up for an account. Integrates with other services like Walgreens to transform our digital moments into printed pictures and other great stuff. Saves everything safely and privately in our own account on a cloud storage service we trust, like Dropbox. We recognize the potential a social media product has in recording family histories. With Briobi, our mission is to create a free social media product that focuses on one objective: telling your life's story. Whether memories and photos are entered directly into Briobi or linked to other social media accounts, Briobi gives you one place to organize your memorable moments and eliminate the social media noise so you can tell your story. App for iOs and Android. EveryStory is an easy way to capture, save, and share the stories behind your favorite photos. Simply upload some photos, tap the record button and tell your story. FAMICITY is a service that allows every people to preserve and enhance their legacy. We expect to revolutionize the way family and friends are sharing by giving them a new place. Our service is available on computers, tablets and smartphones. You can already give it a try and enjoy great moments with family by creating your family tree and share the history of your ancestors. It's simple and made for every one from 7 to 107 years old! GenerationStory is connecting the past with the future. Technology can now bridge the gap from generation to generation. For the next generation, organize your collection and share your story. German. European based family tree program. 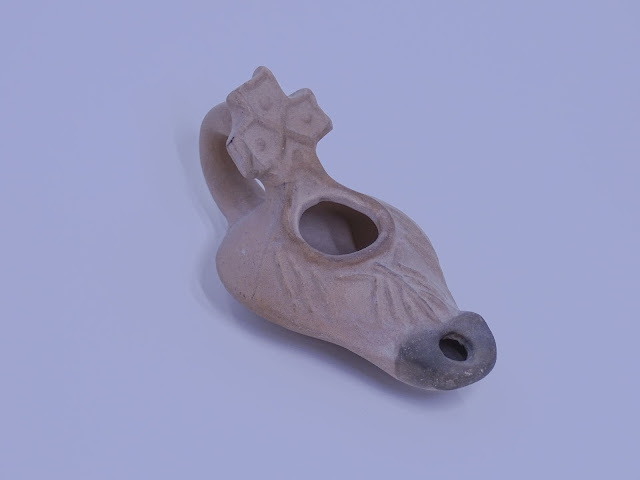 Looks interesting but nothing on the website tells what it is. The only tag line is: Die europäische Online-Plattform für Ihre Familiengeschichte. Here is what I found. I hope this is correct because one meaning of the word is a Japanese historic term referring to visually-impaired Japanese women, most of whom worked as musicians. Goze is a mobile app where you can capture your true-life journey; collaborate on your events; curate your moments by exhibiting photos, videos, and memories; and control your audience by selecting your collaborators or simply saving the moment for yourself. Instantly, you can treasure your memories by exporting your events into photo books and DVD’s. Goze exhibits your life journey and you are the curator. I could not find this one at all. I have no idea how to separate it out from all the similar entries online. EASY & QUICK WAY TO TAKE ADVANTAGE OF THOSE FLEETING CONNECTING MOMENTS, PARENT TO CHILD, FAMILIES TO EACH OTHER. Create and capture the moments that make life sweet. See my comment above about figuring out what this program does. Sorry, but I couldn't distinguish this from weather prediction and pharmaceuticals. I have no idea what this is. in the field of history. Our services range from quality research for individuals and memoirs of living people and histories of the homes they live in and histories of their ancestors to attractive brochures and business materials for professionals and organizations. This is more like what I am writing about when I ask for a short explanation of what the program can do. This is another one with a common name. I cannot seem to find it among all the products with the same name. This is another vague name. I couldn't even connect this one to genealogy as a topic. Sorry again. PostcardTree is a way to find the stories, lost to time and space, about your ancestor's lives. It will allow you to search for any of your ancestors across millions of postcards on the PostcardTree platform. Beautiful. Just what all the rest of them need. A short, meaningful description of what the program does. Scribblitt™ is a launch pad for creativity where kids grab an idea, and using tools provided and collaboration with other kids, teachers, writers and publishers, take it where they want to go, making their own characters, story and illustrations come to life in a professional product. The Legacy Republic community celebrates the family connections made through reliving and sharing memories. We protect yesterday's treasured moments, so they may be enjoyed for generations to come. Legacy Republic offers premium products and services for your most important family heirloom – your memories. Powered by YesVideo, Inc., the largest and most trusted home movie digitization company in the world, we put the same love and attention into our services as you put into your memories. We guarantee you will be happy with the results. Although it doesn't seem to mention a product called "Studio," the program transfers media from one format to another. I just wrote about this program recently. TapGenes helps you crowdsource your family's health information, helping you understand the thread that ties your family's health together. TapGenes offers you the convenience of keeping all your family health history in one safe and secure place. I have written and taught about this program extensively during the past few months. I just wrote a blog post on the program this week. I should disclose that I am actually shown on the website endorsing the program. We are using this program at the Brigham Young University Family History Library to train our new missionaries and volunteers. This explanation should be an example to the other developers. 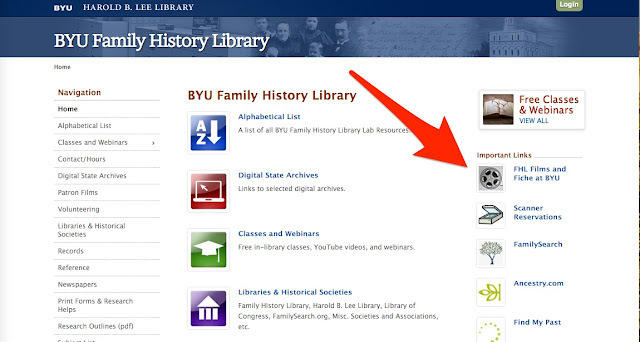 The Family History Guide is a website that represents a best-in-class learning environment for family history. Its scope is broad, but its focus is narrow enough to help you achieve your goals, step by step. Whether you're brand new to family history or a seasoned researcher - or somewhere in between - The Family History Guide can be your difference maker. That developed into an interactive timeline where he collected songs from when he started dating his wife to voice recordings of the couple recalling what it was like to sit across the table from each other for the first time. It was a sort-of digital time capsule that he’s now turning into a company calledThe History Project. The startup just closed $2 million in investments with backers include The New York Times as well as Matter Ventures and Altpoint Ventures. At The History Project, we see a world where the moments that matter are preserved forever and accessed with ease. We strive to connect people with the stories and artifacts of life. As we capture the past with the technology of today, we create positive impact for generations to come. View our team's History Project. The Tribergy prototype allows a user to create a group that has a specific focus or goal. We call these groups Tribes. A Tribe can be private by invitation only, or public groups that others can find & join. 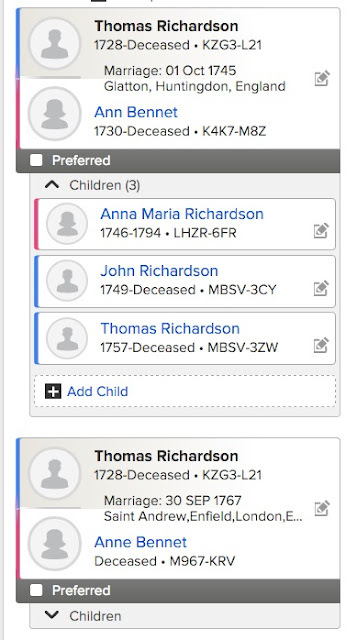 The integration with the FamilySearch API allows Tribe creators to associate the Tribe with a specific person in the FamilySearch Family Tree. When other Tribergy members login with their FamilySearch credentials, Tribergy looks for common ancestors between the member and public Tribes. 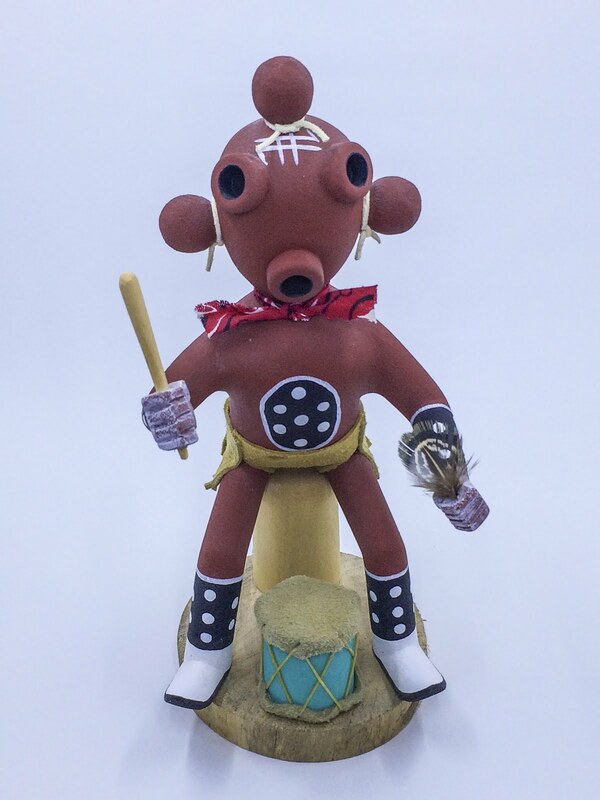 For example, you may start a Tribe for your great grandfather. Other Tribergy members may have an ancestor that is related to your great grandfather. When matches are found, the member is then shown a list of the matching Tribes and given the choice to join that Tribe. This ability to find others that are working on parts of your family tree is an invaluable tool that helps avoid duplication of data and effort, provides a platform for communication, sharing of ideas and resources, etc. Tribergy was designed to fit into any social collaboration environment and not just genealogy. It can be used to plan a family reunion, manage marketing efforts, and manage goals such as writing books, remodeling your kitchen and much, much more. Sorry, can't find this one either. So, that brings me to the end of this list. You can see my observations above. I kept adding them as I worked my way down the list. It will be interesting to see who gets into the semi-finals and finals. I will really try to be at the Innovators Summit this year. 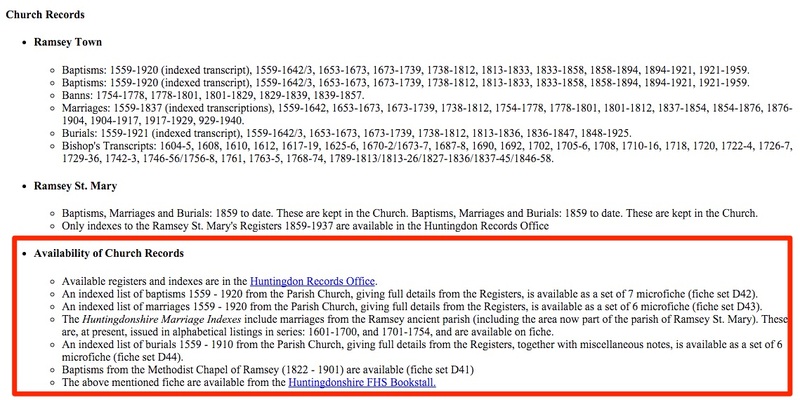 Let's suppose that every last record on earth containing relevant genealogical and historical information was finally digitized and available online. I am not just writing about the remaining microfilm records on FamilySearch.org, but all of the records, every last piece of paper on the planet, that are now sitting in repositories of any kind. I guess that the first impression you would have is to question whether or not this would even be possible and you would probably be right. Collectively, we create a huge number of records every day. Here is an infographic showing how much data in generated every minute. It is a little out-of-date, about a year old, but it gives a good idea of what is going on. For an example of the changes since 2014 when this infographic was created, there are currently over 3.2 billion users, up from the 2.4 billion number just one year ago. As I have pointed out recently, around 43% of the world's population has an internet connection today. The real challenge here is that so many of the world's records have been lost and for many individuals, no records were ever created. Even if my speculation about the digitization of all the world's records were possible, genealogists would still find it a challenge to find records for every individual. Digitization alone does not provide access to the records and from my standpoint, access is a more difficult problem to resolve than the physical digitization of all the records. As time goes on, I realize more and more each day, how limited I am by the availability of records I know exist and by the time it takes to examine those that are available. For example, here is a chart from the FamilySearch.org Research Wiki on one parish in England. I chose Fletton in Huntingdonshire (now Cambridgeshire) to illustrate the time periods and jurisdictions involved in a search of the parish records. You might notice that three of the four websites referenced are paid sites. This illustrates the challenge. You might think that digitization alone will solve the problem of finding your ancestors, but the real problem is that despite digitization, the records will still be fragmented into a myriad of websites all over the world. In fact, for many people finding the records online and then gaining access to those records may present as much of a problem as finding the un-digitized records today. My other blog is Rejoice, and be exceeding glad..., which is written with an emphasis on issues important to members of The Church of Jesus Christ of Latter-day Saints (Mormons). You may wish to review the older posts for additional information on the latest developments in genealogical research tools and methods. If you find this information useful or interesting, please take time to pass along the blog address to others who may be interested. Old FamilySearch.org Website still alive? Is there a "best" genealogy program? Is Genealogy History or is All History Genealogy? Is it privacy or rewriting history? Chaos and Genealogy -- How Accurate Can We Be? When is a source not a source?